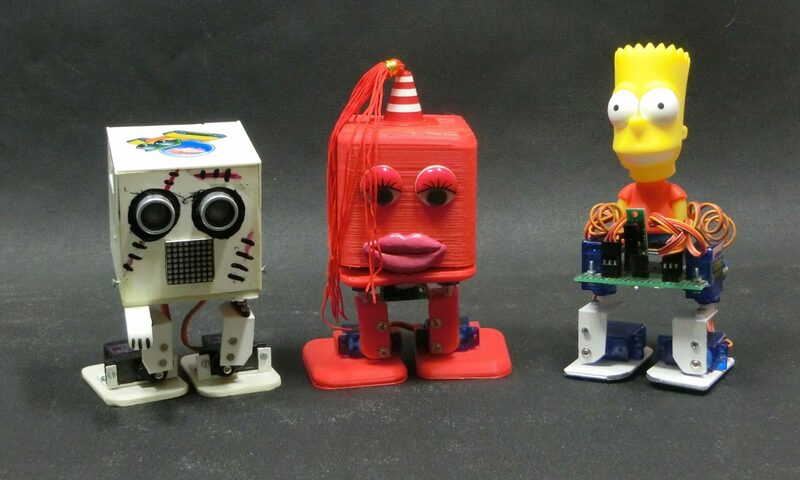 This is part 1 of a series of robotics tutorials with the IOIO controller. 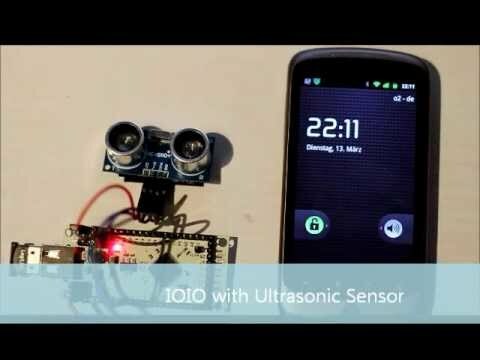 It shows how to connect a cheap ultrasonic sensor to the IOIO board and how to write a Android program to read the sensor. The Android phone is connected to the IOIO board via Bluetooth here, but the program works in both ways. Wired over USB or wireless over Bluetooth. The software is available for free use, download it here. Only the setup and the loop function is shown. 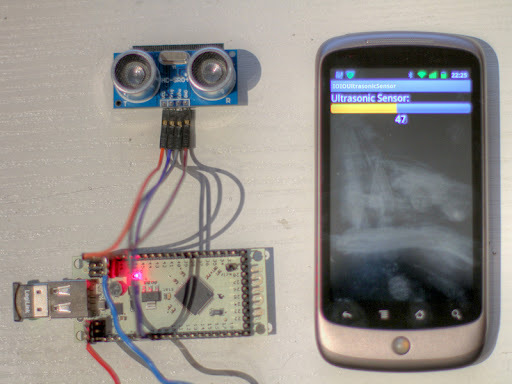 The video is showing the sensor connected to the IOIO board and the Android app. Firstly, great tutorial and congratulations! My project is simylar, but I’m can trying to use a URM37 ultrasonic sensor connected with IOIO board, unfortunately, the same code is not working out. I changed the pins. Do you can help me? Sorry, I have no code or wiring for the IOIO to URM37. then, how can i use it? You mean a Parallax Ping? Have you tried to use 2 IOIO Pins connected together to the Ping IO? Peter, it is not necessary to trigger programmaticly the trigger every IOIO loop. 3.- Enjoy reading ONLY duration! Gergely, you can feed every trigger with same IOIO pin if sonars are far between them and cover much greater range than 30Âº (measuring range is 15Âº) to avoid echoes from each other sonars. But if you still having echo issues you can round-robin every sonar trigger by using a decimal or BCD counter (as 74160) and a BCD to decimal converter (as 74145) connected to its output. Feed the counter’s clock with IOIO PWM pulse and the output of counter as bcd-to-decimal’s input. Connect every decimal output pin to every sonar and voila! This way every IOIO pulse will trigger next bcd-to-decimal output, so you can connect 10 sonars (left some of them unconnected if you wish) and configure a IOIO trigger frequency of 1 / 5ms = 200 Hz (20 Hz every sonar). Don’t worry about trigger rise time, the minimum is 5 ms, but it could be longer if you wish, so you can use a safe (recommended) frequency of 16 Hz for every sonar, 16 x 10 = 160 Hz total IOIO PWM frequency. Best regards (and sorry my bad english, I’ll write on my blog about sonars very soon, but in spanish). Have you tried this code with multiple sensors? I modified your code for 4 sensors. With one it works fine. With four the main IOIO loop runs only once, sometimes do not finish its first loop, sometimes it runs 2-3 times. I also tried to instantiate the pulse input inside the loop instead of the setup and close it after the measurement is done and before working with the next sensor,ï»¿ because I thought that there might not be enough double precision pulse input module. The same problem occurred noï»¿ mater what i have tried. I also checked the sensors individually and alone they work. Do you have a solution for multiple ultrasonic sensors with this setup?